CROQUANT CHOU ZAKUZAKU offers unique freshly baked extra crunchy cream puffs in stick form filled with Hokkaido milk cream. Modeled after Japanese chou cream puffs they are a class of its own. Let us introduce you to their shop in Harajuku. Cream Puffs, also known as Chou Cream, are extremely popular in Japan. Normally they are round, soft and filled with a rich flavored cream. They come in a vast variety of flavors such as vanilla, chocolate, matcha green tea, and seasonal favorites like sweet potato and pumpkin. In this article, we will introduce you to CROQUANT CHOU ZAKUZAKU in Harajuku. They specialize in extra crunchy and stick shaped cream puffs filled with rich Hokkaido milk cream. CROQUANT CHOU ZAKUZAKU originated in Hokkaido. They don't have shops in Hokkaido but are sold in department store food courts. The first CROQUANT CHOU ZAKUZAKU shop opened in Harajuku in May 2015. It offers an unusual and elegant interior compared to the otherwise playful and colorful Harajuku area. This is especially outstanding because it is located inside the CUTE CUBE HARAJUKU on the Takeshita Street beside colorful shops such as The Pom Pom Purin Cafe and CANDY*A*GO*GO. The shop is held in a fashionable shiny black with glass diamonds hanging from the ceiling. The diamonds are meant to resemble the almond crunch used on top of the croquant chou and the soft serve ice cream. "Zakuzaku" means "crunchy" in Japanese. Most cream puffs have a fluffy and soft exterior containing the delicious cream. However, ZAKUZAKU CROQUANT CHOU offers an extra crunchy exterior topped with almond crunch. It was created to offer an interesting contrast to the rich velvety cream and to make the cream chou experience even more delicious than it already is. The croquant chou's are freshly baked in the shop and its delicious smell wafts through the air as you enter. To ensure the outside stays crunchy, the chou is filled with the cream after your order and not in advance. The stick shape makes it easy to hold and eat while strolling down Takeshita street. The two items that are available at ZAKUZAKU year-round are Hokkaido milk croquant chou and soft serve ice cream. The standard croquant chou (250 yen including tax) is the first item ZAKUZAKU ever invented. It is filled with vanilla flavored milk creme. The cream is made from high-quality rich Hokkaido milk. Hokkaido is known all over Japan for its high-quality and delicious milk. The outside of the croquant chou is thick and crunchy but also light and airy. The cream is smooth and has a strong vanilla flavor. The croquant chou is not too sweet and would probably also taste great with coffee or tea. The ZAKUZAKU soft serve ice cream is 450 yen including tax. 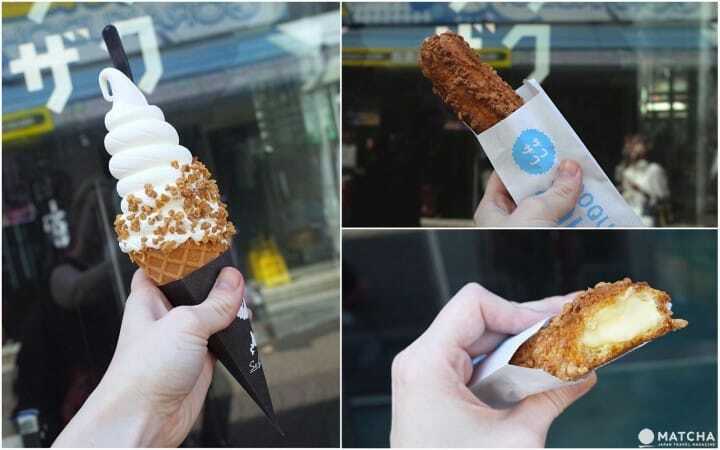 It consists of an ice cream cone, or a plastic cup, filled with creamy soft serve, topped with the same almond crunch as the ZAKUZAKU croquant chou. The soft serve is not vanilla flavored. It has a pure sweetened milk taste resembling the richness and of whipped cream. A perfect choice for the hotter days. Time Limited Items - Get Them While You Can! Besides the fixed line up, ZAKUZAKU also introduces limited edition items according to the season. When I visited they offered a croquant chou filled with purple sweet potato cream, a popular Japanese autumn flavor. They also had a ZAKUZAKU ice cream cup topped with purple sweet potato cream. The croquant chou was richly flavored and vividly colored. It was a little less sweet than their original croquant chou due to the sweet potato. For Halloween, they offer a black version of the purple sweet potato croquant chou. The dough is made with pure cocoa powder, turning it black. They also have a black ZAKUZAKU soft serve ice cream with white chocolate coating containing charcoal powder to color it black. The ice cream cone is also made with cocoa powder to appear black and creepy. Both are available until October 31st, so make sure to try them if you are in Japan during this time. ZAKUZAKU's CROQUANT CHOU has a truly unique texture. Even though it was created with the popular Japanese cream puffs in mind, it is actually a completely new kind of dessert in my personal opinion. It's a great snack to enjoy while sightseeing or window shopping, so besides Harajuku, you can also find their shops in many other popular sightseeing places all over Tokyo and Japan such as Shinjuku (Tokyo), Tokyo Sky Tree's Solamachi, Osaka, Miyazaki, and Fukuoka. Why not give CROQUANT CHOU ZAKUZAKU a try during your next trip to Japan? Popular Places in Tokyo: Shibuya, Shinjuku, Asakusa, Ginza and More!